Billionaires are the richest of the rich. Many young entrepreneurs hope to one-day reach this ultimate financial milestone. But before these entrepreneurs are allowed to join this group, they first must ask how did billionaires acquire their wealth in the first place? 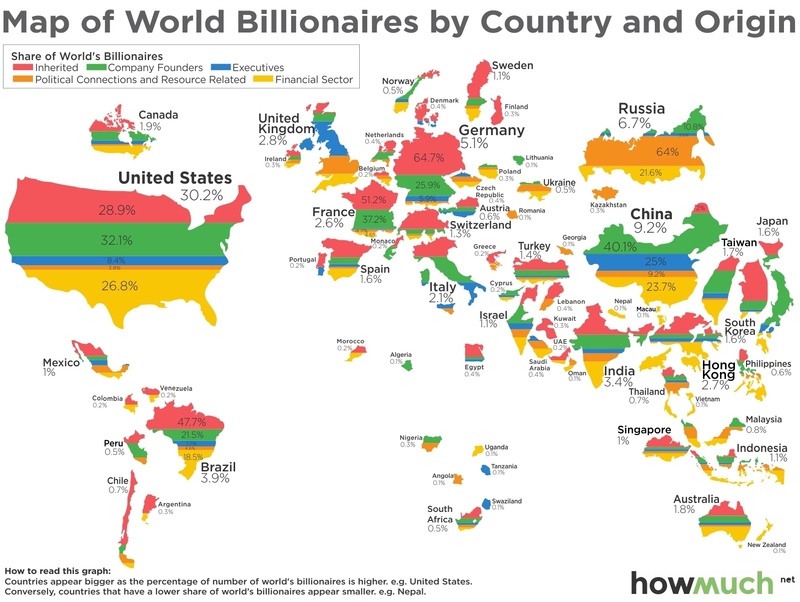 Take a look at the map below to see the distribution of billionaires by country and type. The map above shows each country of the world separated by the percentage of billionaires into various types. The size of each country on the map is relative to its total number of the world’s billionaires. There are five categories of billionaires designated by the colors found in the legend: Inherited, Company Founders, Owners and Executives, Political Connections and Resource Related and the Financial Sector. The data was compiled from this report by the Peterson Institute for International Economics. The first and most obvious conclusion to draw from the map is the large number of billionaires found in the United States. The world’s largest economy has close to 30 percent of the world’s billionaires and far more than any other single country. The distribution of billionaires in the United States is mostly equal, with the exception of the Political Connections and Resource Related type. Only 3.8 percent of American billionaires attained their wealth through political or resource related ventures, a likely consequence of the US government’s historical hands-off approach to business. China, the world’s second largest economy, has very few billionaires who inherited money. Before China’s economic success of the past few decades, the country was exceptionally poor. But the rapid growth of its economy through a manufacturing boom has created over 200 billionaires. Around 40 percent of these billionaires are company founders, while around one-quarter are company owners or executives. An opposite trend can found nearby in South Korea. The majority of South Korean billionaires, a whopping 74.1 percent, inherited money from family. In Japan, the majority of billionaires are company founders at 63 percent. The trend in South Korea can also be found in Europe to an extent. With the exception of the United Kingdom, many of the billionaires in the major economies of Europe inherited their wealth. Denmark has the highest percentage, with 83.3 percent of billionaires inheriting their money. Germany comes in second, at 64.7 percent, while Sweden comes in at a close third at 63.2 percent. Europe follows a slightly different path than the United States. While American billionaires are less likely to have inherited wealth, they are more likely the be either the founder of a company or come from the financial sector. The United States boasts the highest number of billionaires by far and American billionaires acquire wealth almost equally from inheritance, the founding of a company and the financial sector. The number of Chinese billionaires has grown rapidly, with most being either company founders, owners or executives. Many European billionaires inherited wealth, but a large number are also either company founders or from the financial sector.